I get it, you don't have time to read. Fortunately it's 2015 and we've got life hacks and workarounds. Since the intention behind everyone reading the same book is so that we have some shared experience to discuss when we meet, why don't we do the same with a podcast? There are a plethora of great podcasts out there that are chock full of SEJNES we can extract, many of them are even interviews with authors. Some of you may have heard me mention my discovery of the book "God's Debris: A Thought Experiment" by Scott Adams this summer. This is an amazing little book by the creator of Dilbert, which only adds to the weird awesomeness of it. 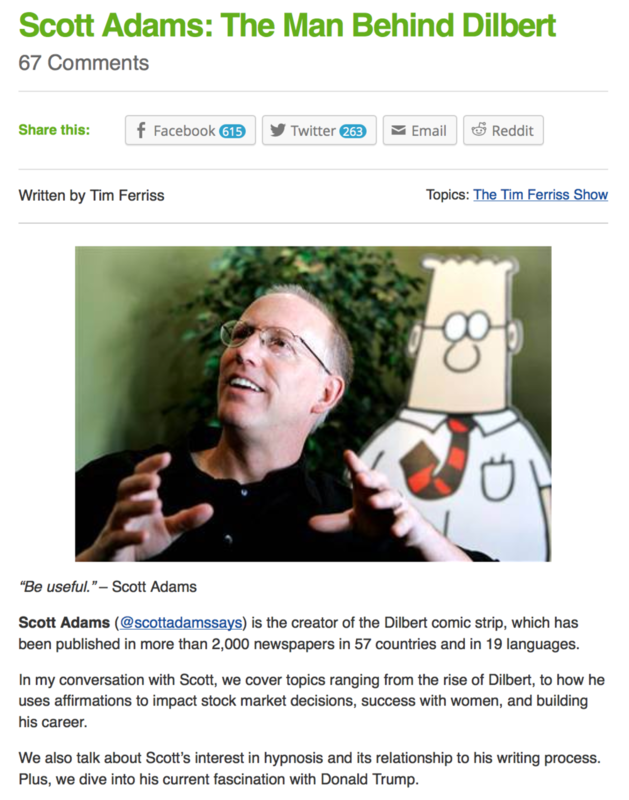 Not-randomly Scott Adams was recently interviewed on the Tim Ferris Show Podcast and Quester Carter Twitty was kind enough to pass this on to me. The interview is as mind blowing as the book to be honest. I think it is a perfect nomination for our first podcast for the first Helping Friendly Podcast Club Meeting on November 4th. Follow the link below, read a little more about it, and then give it a listen. On November 4th Nile, one of our Founding Questers who moved to London last year, will be back in town and we wanted to have a together. This seems like to perfect opportunity. Please let us know if you have any questions and enjoy the podcast! It's great!